Perhaps no character in the Fallout universe is as beloved by players as Dogmeat, the canine companion to every Lone Wanderer to leave (or be thrown out of) his vault. He doesn't care who you are or whether you're good or evil. So long as you feed him, exercise him regularly and generally avoid shooting him in the head, Dogmeat will be your friend until the end. This makes him unique in the Wasteland. Dogmeat first appeared in 1997's Fallout, developed by Black Isle Studios and distributed by Interplay, where he can be found in Junktown terrorizing a man named Phil. If you feed him an iguana-on-a-stick or are wearing a leather jacket like his previous owner, Dogmeat will follow you and never again leave your side. If you want him gone, you either have to shoot him, Old Yeller-style, or wait until someone else does the job for you. "Dogmeat ended up getting a terrific bonus to knock down and was actually rather useful," says Chris Taylor, Lead Designer of Fallout (and Lead Systems Designer for Interplay's "Project V13," the working title of the widely speculated Fallout Online MMOG). "Far more useful, at least, than Ian. At least Dogmeat never shot me in the back!" Fallout's Dogmeat has been described as a "killing machine" and a "tiny god." He can chew up foes with four attacks per round, often knocking them prone, and his 50 hit points make him tougher than you in the early stages of the game. "Dogmeat specifically had strong stats for two main reasons," says Jesse Heinig, Fallout Scripter/Designer and current freelance game writer for White Wolf/CCP. "One, he was an iconic character to add to the game, so it would be rather undramatic for him to be weak and useless; and two, since he couldn't use ranged weapons, he needed to be tough enough to contribute somehow in melee combat." If there is one person to thank for Dogmeat, it is likely Heinig. Tim Cain, Lead Programmer and Designer of Fallout and currently the Design Director of Carbine Studios' unannounced MMOG, notes that Heinig was the one who figured out how to get followers working in the first place. ("We never planned for them in the design," says Cain.) No followers, no Dogmeat. Dogmeat's limitations ultimately become clear, however: Without ranged combat abilities, armor or the ability to take commands, he's often torn to bits by the end of the game - as was the plan all along. 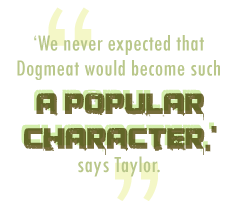 "We never expected that Dogmeat would become such a popular character," says Taylor. "I always intended that the various NPCs that joined up with the player would come to a violent end. I was shocked when I heard of all the work people went through to keep Dogmeat alive to the end - especially the hell that they went through with the force fields in the Military Base."